Hold a barbell (an EZ bar works, too) with an overhand grip. Place your hands roughly 6″ apart. Under control, slowly pull the bar up to the top of your chest — keep your elbows flared up so that they’re higher than your hands. Your core should be tight throughout. Hold it for .5s at the top and slowly lower back down to the bottom. Tip: Superset back-to-back with #14, Front Plate Raises. 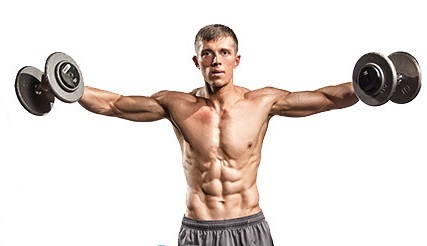 Stand tall and hold the sides of a weight plate at your waist. Powerfully contract your delts and raise the plate up to your face. Keep your arms locked. Hold it for 1s and slowly lower back down. Tip: Raise the plate all the way overhead. Stand tall with two dumbbells over your thighs. 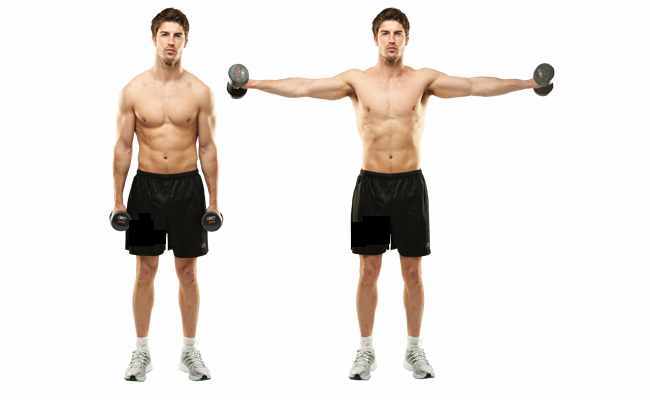 Bend your arms slightly, contract your delts, and powerfully raise the dumbbells straight out in front of your face. Hold for 1s and slowly lower back down to the bottom. Tip: You can also alternate arms one after another to further isolate the individual shoulder caps. Stand tall with two dumbbells. 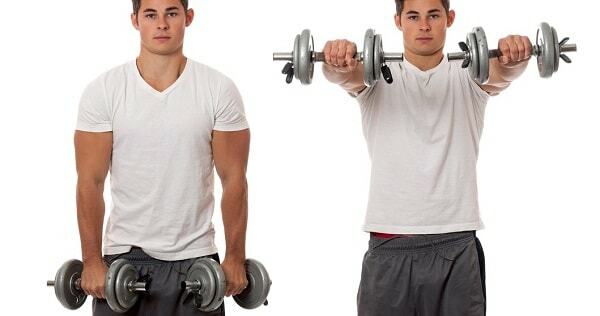 Keep your arms straight and raise both dumbbells straight out sideways until they reach shoulder height. Your body should form a big T.
Hold for 1s at the top and slowly lower back down.